An area author’s personal family history has inspired her latest novel, to be featured in a series showcasing Canadian women’s stories over the last 150 years. Reid is the author of three novels in the Caleb Cove Mysteries series, including Came Home Dead, published in 2014, along with Came Home to a Killing and Came Home Too Late. Cochrane’s Tea … And Other Things carries the books in its local authors section. Reid has made fast work of her second career, given the Didsbury-area woman really started fleshing out her fiction only after she retired from her job as a teacher in 2013. Last fall, Airdrie publisher Books We Love approached Reid to pen one of 12 historical novels in their Canadian Historical Brides series to honour Canada’s 150th birthday. The first book, titled Brides of Banff Springs, was written by Calgary author Victoria Chatham and released in January. The second featuring an Ontario story was released in March. Fictional archival stories of immigrant brides and grooms from all provinces and territories will continue to find their way into bookstores until July 2018. Reid’s novel, titled The Left Behind Bride and set in Nova Scotia, is the 10th in the collection and will hit shelves next April. The main character, yet unnamed, is a bride for just 10 days when her husband is shipped overseas and does not return. The widow is then courted by a fisherman – who gets lost at sea. Reid’s own mother was widowed at 24 years old, and she said her mom’s experiences were inspiration for the fictional bride’s challenges in the novel. Reid said she won’t give away too much more of the plotline – but she’s excited in general to share stories about such a rich time in Canada’s history about women who haven’t yet had a spotlight shone on them. 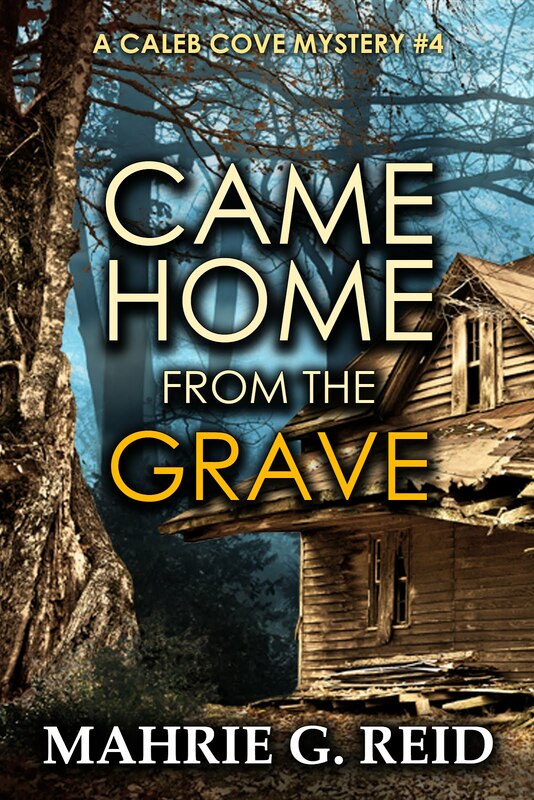 Reid will continue to write The Left Behind Bride, and in the meantime is about two-thirds of the way through the fourth Caleb Cove book – entitled Came Home from the Grave – which is due out in June. Fast-paced suspense, atmospheric setting, resourceful heroine. Impossible to put down. Emily Martin is a genealogist by profession, but her own family history is hidden, even from her. This story begins when a letter arrives from her absconding—and once criminal—father who has secrets to reveal. But someone is shadowing both the father and the daughter. Someone with revenge on his mind. Most of the story takes place in the haunting and atmospheric setting of Caleb's Cove in Nova Scotia, where a small and tightly-knit community holds a bagful of secrets. There are moments in this story with the cozy feeling of an Agatha Christie novel, but danger is right around the corner, ready to sweep the ground from under your feet and take you along on a thrilling ride. I did not want to put this book down, and neither will you. Grab it right away. 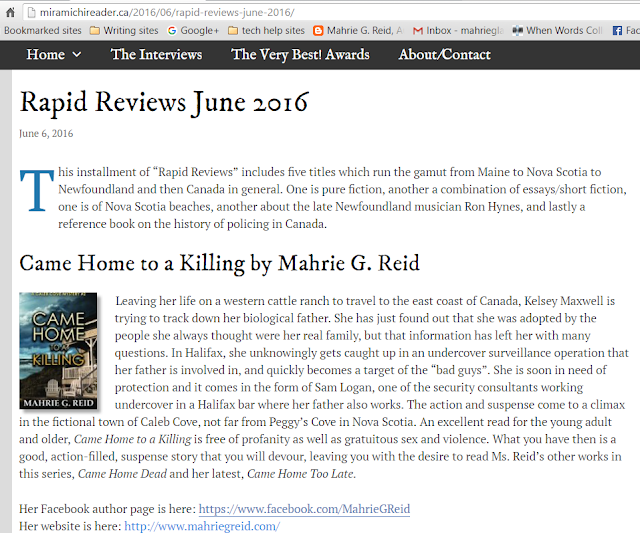 CAME HOME TOO LATE is the 3rd book in Mahrie G. Reid’s Caleb Cove Mystery series and I think it's the best so far. The heroine, Emily Martin, is a well-developed, sympathetic character, and the hero, Harvey Conrad, is strong and smart, like a great mystery sleuth should be. The hint of a potential romance between the two adds a little somethin’-somethin’ to this modern cozy but in no way detracts from the plot. The author drops you into the intrigue right from the start with a woman on the run from an unknown threat and works her pacing to keep the reader on the edge up to the very last page as the mystery unfolds. The beautiful Nova Scotia setting is again front and centre with the unique cultural references woven in with a light hand. Anyone who enjoys small town cozy mysteries in an updated Murder She Wrote style is sure to love this series. cause she said she couldn't put it down. Can't wait for book three!! Sheldon Harris is a jerk, but he doesn’t deserve to wash up dead on an island off Nova Scotia during a hurricane. Devon Ritcey doesn’t deserve to be blackmailed, and Greg Cunningham doesn’t deserve to have his pity party interrupted by finding Sheldon’s body, but that’s life. Greg has withdrawn from his former life as an undercover police officer and come home to Nova Scotia to recover from his physical and mental wounds. Between the arrival of Devon Ritcey, a childhood friend with whom he shared one passionate night and the finding of Sheldon’s body, Greg is forced to face life again whether he wants to or not. 5.0 out of 5 starsBeautifully Crafted...A Great Read! This setting is so realistic and so perfectly established that I can smell the shores of Nova Scotia. and the author has done an excellent job of fleshing them out without overdoing introspection. A lovely balance. A true pleasure to read. Refreshing! Canadian novels and the authors created many popular novels about different types of issue.They may have this essay-company review regarding the current novels in the canadian history.There are many writers and creators for the development of the histroy of the canada.